Seven years in the making and the Chilcot Report confirms virtually everything said by the anti-war movement in the lead up to the invasion of Iraq. The conclusion was pre-determined, the intelligence was full of holes, the British military were ill-equipped for an adventure in the desert, it was known beforehand that chaos and terror would be the invasion's children, and last of all it was pointless and unnecessary. As we know, our soon-to-be-ex-Prime Minister acquired a gambling habit that will cost us all dear. But in a way, Dave's deliberate positioning as the heir to Blair, perhaps unbeknownst to him, led him to ape "The Master" when it came to brinkmanship. Blair's desire to "sort out" Iraq came off a roll of foreign policy "triumphs". In 1997 part of Labour's success in weaning swing voters off the Tories was the party's business-as-usual pitch. There were to be no nationalisations, no splurging of the public finances. Just careful, competent management of the economy, a commitment to "what works" (i.e. privatisation and marketisation of services), and investment in crumbling infrastructure. Furthermore, as per the celebrated deal Blair had struck with Gordon Brown, the chancellor looked after domestic issues, particularly where matters economic were concerned, while Blair had a free hand elsewhere. One of these was the determination of New Labour's "ethical" foreign policy. The West's view of the world in the late 1990s basked in the afterglow of the collapse of the USSR and its client regimes. Dictatorships in the East and Global South were giving way to nascent liberal democracies and a new world order of globalised capitalism. The West had won and now was the moment to impose a new settlement. Liberal internationalism, or "humanitarian" imperialism - depending on where you stand - was the foreign policy doctrine of choice in Washington and London, and was informed by two suppositions. The first was the "lesson" that military competition with the West destroyed the Soviet bloc and ushered in market and democracy-friendly governments in Eastern Europe - so standing up to tyranny pays. The second was the trauma of the Rwandan genocide. The so-called international community stood aside as about a million people were butchered in a state-sponsored blood rage. Victory in the Cold War showed what good interventionist policies can bring. What happened in Rwanda stood-in for the consequences of doing nothing. Therefore it had ready ideological cover to range where it pleased and was always already predisposed to meddling and intervention. Blair was fully signed up to an interventionist foreign policy to try and solve the world's problems and make it safe for freedom and, whisper it, business. To his credit New Labour were committed to the peace process in Northern Ireland, which began under John Major, and Blair and his team deserve full credit for delivering the Good Friday Agreement. One intractable problem, solved. Contemporaneously, the conflict in the former Yugoslavia boiled over into the Kosovo crisis. Previous "humanitarian" intervention had seen the bombing of Bosnian Serbs - the "baddies" in media constructions of the conflict - and had the assisted ethnic cleansing of Serbian Krajina by Croatia in 1995. When the oppression of the Albanians of the Serb provoked resistance, a low-level conflict simmered up until the late 90s, when Milosevic set in what remained of the Yugoslav army to stamp out the Kosovan Liberation Army. Under the attempt by the Western powers to bomb Belgrade to the negotiating table, Serb forces managed to expel about a million Kosovars. Blair was an enthusiastic participant in the bombing campaign, and it appeared to work. The Serbs were no match for NATO air power, they withdrew, Kosovo became a Mafia-riddled UN protectorate, key figures - including the loathsome Milosevic - ended up in The Hague, and everyone could pretend it was a triumph for muscular liberalism. Then came Afghanistan. After September 11th "something" had to be done about the Taliban. Cashing in the capital earned from the appalling attacks, the US pulled together a NATO coalition and started bombing Afghanistan barely a month after the fall of the towers. Providing air and special forces support for the Northern Alliance, the US and Britain helped drive the Taliban from Kabul in November. In early 2002 an interim government was formed out of exiles and anti-Taliban militias, backed up by American military power. A new liberal democratic constitution was ratified in 2004 and the first nationwide election since 1973 was held in 2005 on the basis of universal adult suffrage. Again, as a full participant in this war the ease with which the country appeared to be taken must have reinforced Blair's preference for interventionism. Remember, in the build up to Iraq the running sore of Afghanistan was not then apparent. The lesser known 2002 British intervention in Sierra Leone makes a more convincing argument for liberal militarism than the Kosovan conflict. After 11 years of civil war, British forces were sent in to rescue foreign nationals as a hard won peace accord collapsed. But with scarcely any debate or media coverage, the British abandoned its mandate and defeated the rebel Revolutionary United Front, a peasant-based nationalist outfit noted for its thuggish cruelty and penchant for amputating limbs. It ended the civil war, restored peace and started rebuilding the country's shattered infrastructure. Blair was then, and is still regarded fondly by large numbers of Sierra Leoneans for the "services" rendered, and helps explain why Britain did much of the leg work during the Ebola crisis. And one shouldn't forget the first Gulf War between the West and Iraq, which set the tone for the hegemonic foreign policy to come. The invasion of Kuwait by the million-strong Iraqi army, then considered the fourth largest in the world, and the subsequent coalition building and assault under US leadership had absolutely nothing to do with humanitarian concerns, but was dressed up and sold that way. Saddam Hussein wasn't removed from power, but it was a victory for democracy as the ruling Al-Sabah family scuttled back to Kuwait under Western protection. It was also in the name of humanitarian intervention that sanctions were applied and destroyed Iraq's economy, plunged its people into misery, and were occasionally bombarded under some pretext or another. This, obviously, was not Blair's doing but he inherited a set of foreign policy priorities that list Iraq and its grotesque regime the number one bogey. His toadying to Bush was as much continuity John Major as the Good Friday Agreement. 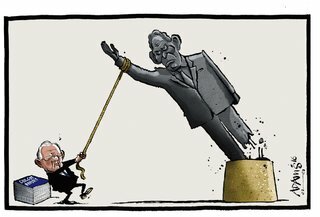 Of the four, Northern Ireland and Sierra Leone have been the most enduring of Blair's accomplishments. Kosovo is still an impoverished proto-state going nowhere fast, but at least the spectre of ethnic cleansing - of Kosovan Albanians at least - has gone. And Afghanistan? Well. But for someone at the time sold on liberal interventionism, each in their way could have been read as mission accomplished. If you wanted to believe and were prepared to suspend your critical faculties, there was ample grounds for those beliefs. I don't think Blair should go to The Hague. I've never been convinced about the legalistic and procedural arguments around the invasion of Iraq, especially when the grounds for opposing it were ample. But what Blair is guilty of is criminal negligence and recklessness, and there is a 2.6 million word judgement to back that up. Dumbya should have accepted Iranian offers of practical help after 9/11. thrown everything at the Taliban and pursued a policy of aid to any regimes that were prepared to work constructively and peacefully, trade and aid, not bombs. Who now thinks the axis of evil speech was a good idea? No, making peace with Iran had to wait for Obama and I applaud him where others wouldn't for averting two disastrous could have been wars in 2009 and against Basher Assad (which any idiot could have said would benefit Islamic State) in 2013, and for bringing that great nation in from the cold. While at the same time, the "alliance" with the Gulf states is stronger than ever, despite their war crimes in Yemen. Russia, by contrast, has done far less harm in this department, though I wouldn't have thrown them the free gift of Brexit, myself. You want to read the unmissable Daniel Larison if that's what you're after. He throws in views on Brexit which aren't mine, but are more interesting than the vomitings of most British commentators. PS- Were you on the train today? Someone looking like I think you look was getting off at Stoke, about 17:35, pausing to speak to a woman. I was walking past wearing a red coat, on my way to the toilet. It's a small world. Don't go LM on us! Serbia was the prime mover in the disintegration of federal Yugoslavia - and the Bosnian Serbs were the 'baddies' in any reasonable construction of the Bosnian conflict. As for whether Blair should go to the Hague, there's a very good case - which is as good as stated by Chilcot - that the Iraq invasion represents the crime of aggressive war. That said, the ICC only starts to have jurisdiction over the said crime in 2017, and it won't be retroactive - so there's no chance of it actually happening. I also somehow forgot to mention that Dave is certainly no better, having "helped" turn Libya into a failed state and the clusterfuxk he almost started in Syria in 2013, where he was pulled back from the brink by none other than Ed Miliband. Imagine if that had gone ahead? So it's no wonder he keeps a low profile. Definitely not, Phil! You are absolutely right. Nevertheless, what the Bosnian Serbs visited upon Bosnian Muslims and Croats was a whirlwind they reaped in Croatia and Kosovo - with the backing of our "humanitarians". I was worried about what you would write but I'm pleasantly pleased, if not surprised that you don't jump on an unjustified band waggon of nonsense we have heard to date. I've read your article twice but I see no guidance of whether the war was an 'illegal' one, a term much challenged by both sides of the international legal camp. Tony Blair, 'the biggest terrorist on earth'. This is very wrong. Tony, for whatever you think of him, is a deeply held religious man who answers to his God frequently and we are led to believe that instead, he is a monster. No. Hindsight is wonderful and Chilcot seven years to gain such a skill but didn't Tony's internal critics wait patiently? Some of the criticism I've heard over the last few days hasn't made much sense but still they piled it on. The intelligence was flawed, they said. We knew that at the time. We were told clearly, that no CIA or MI was there to be had. What was on offer were dissidents and insiders of the Saddam regime who made it clear that Iraq had the capability to produce WMD, after all, he did build a nuclear reactor with his nuclear scientists. Tony didn't lie but any Government is guilty of over egging all cakes they make and that is probably his mistake. UN to Hans Blix, Chief weapons Inspector: "Have you been given unfettered access to all areas you identified?" History might have been different if he had said Yes. If you want to indulge your fantasies about putting prominent people to death, I suggest you do so elsewhere.